Why are Pedestrian Accidents on the Rise in 2018? An alarming number of pedestrian accidents have caused several deaths and injuries in Portland recently. On October 12, a Portland woman was killed in a hit-and-run crash as she was crossing SE Division Street near 138th. A car slammed into her, drove away, and then she was struck again by a drunk driver while she was lying in the street. And only the day before, three pedestrian accidents occurred in the Portland area. A man was hit by a semi-truck while crossing Burnside Street in Gresham. He was taken to the hospital with life-threatening injuries. Another man was hit and killed by a car on northbound I-5 in Washington. Finally, a pedestrian in a marked crosswalk was seriously hurt when he was hit by a car turning onto East Burnside Street. That’s four pedestrian accidents in the span of 48 hours. Learn why pedestrian accidents are on the rise in 2018 as GSHA sheds light on the issue. According to the Governors Highway Safety Association (GHSA), pedestrian fatalities in the United States have grown substantially faster than all other traffic deaths. The number of pedestrians killed in motor vehicle crashes nationwide in 2017 was nearly 6,000, which is essentially unchanged from 2016. The GHSA points out that it has been more than 25 years since the U.S. experienced this level of pedestrian fatalities, and because both 2015 and 2016 saw large increases in pedestrian fatalities, the continuation of pedestrian fatalities at the same pace in 2017 raises continued concerns about the nation’s disturbing pedestrian death toll. 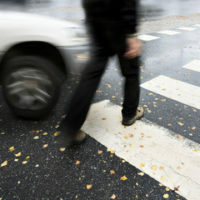 The number of pedestrian fatalities in Oregon and Washington follows the troubling trend. From January to June 2016 in Oregon; there were 29 pedestrian deaths. During the same six months in 2017, there were 35, a 20.7% increase. In Washington, there were 36 pedestrian deaths from January to June in 2016, and 44 in 2017, a 22.2% increase. The GHSA links (although not definitively) two notable factors to the increase in pedestrian accidents in certain states and nationwide: (1) the growing number of state and local governments that have decriminalized the recreational use of marijuana, which can impair judgment and reaction time for all road users, and (2) the increasing use of smartphones, which are a significant source of distracted driving regardless of travel mode. The seven states—including Oregon and Washington—that legalized recreational marijuana use between 2012 and 2016 reported a collective 16.4% increase in pedestrian fatalities in the first six months of 2017, and the National Electronic Injury Surveillance database shows the number of cellphone-related Emergency visits is increasing in parallel with the prevalence of cellphone use in the United States. If you or a loved one has been hurt in a pedestrian accident in Vancouver, WA or Portland, OR, please contact pedestrian accident attorney John Lutgens to discuss your options for recovery. Holding at-fault drivers responsible for pedestrian accidents is one way to bring awareness to this problem.